Dr. William R. Belcher was one of the first graduate students to be part of the Harappa Archaeological Research Project (HARP). He obtained his B.A. and M.A. in Anthropology at Western Washington University and his M.S. in Quaternary Studies from the University of Maine. He earned his Ph.D. under the direction of Dr. J. M. Kenoyer at the University of Wisconsin in Madison. 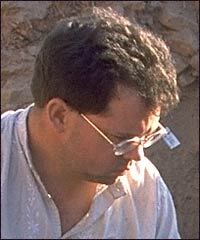 He is currently Assistant Professor (Archaeology) at the University of Hawai'i - West O'ahu in Kapolei, HI. His field of concentration is an ancient Indus economy built around large-scale, efficient methods of trading persishable fish across hundreds of miles five thousand years ago. Belcher, W.R. 1999. The Ethnoarchaeology of a Baluch Fishing Village. In Archaeology of Seafaring: The Indian Ocean in the Ancient Period, edited by Himanshu Prabha Ray, pp. 22-50. Indian Council of Historical Research and Pragati Publications, Delhi, India. Belcher, W.R. 1998. University of Wisconsin-Madison: USA, Ph.D. in Anthropology. Ph.D. Dissertation: Fish Exploitation of the Baluchistan and Indus Valley Traditions: an Ethnoarchaeological Approach to the Study of Fish Remains. Belcher, W.R. 1997. Marine and riverine resource use during the Indus Valley Tradition: a preliminary comparison of fish remains from Balakot and Harappa. In South Asian Archaeology 1995, edited by B. Allchin and F.R. Allchin. Oxford and IBH Publishers, Pvt. Ltd. New Delhi, India. Belcher, W.R. 1994. Multiple approaches to the reconstruction of fishing technology: net-making and the Indus Valley Tradition. In From Sumer to Melluha: Contributions to the Archaeology of West and South Asia in Memory of George F. Dales, edited J.M. Kenoyer, pp.129-140. Wisconsin Archaeological Reports 3. Madison, Wisconsin, USA. Belcher, W.R. 1994. Butchery practices and the ethnoarchaeology of South Asian fisherfolk. Fish Exploitation in the Past, edited by W. Van Neer, pp. 169-176. Annales du Musee Royal de l'Afrique Centrale, Sciences Zoologiques No. 274. Tervuren, Belgium. Belcher, W.R. 1993. Riverine and marine fish resource utilization of the Indus Valley Tradition. Journal of the Pakistan Archaeologists Forum 2:1&2:241-279. Karachi, Pakistan. Belcher, W.R. 1991. Fish resources in an early urban context at Harappa. In Harappa Excavations 1986-1990: a Multidisciplinary Approach to Third Millennium Urbanism, edited by R. Meadow, pp. 107-120. Prehistory Press, Madison, Wisconsin, USA.